Bottom Line: You may be able to better digest your food and feel better overall, which means it’ll be easier to make any diet and exercise routine work. 2. History of the Brand: How Did PrebioThrive Start? 10. How to Use: Special Instruction, The Regimen, etc. 23. Verdict: Would I Recommend PrebioThrive? Unless you’ve been living under a rock, I’m sure you know probiotics have become all the rage recently. There’s plenty of research that shows probiotics are helpful, but we all know that all the supplements out there are different, and quality and effectiveness most definitely vary. So, I wanted to find out if PrebioThrive is the real deal, or just another product trying to cash in on the trend while it’s hot. I researched what other people are saying in prebiothrive review, and I ordered the supplement for myself so I could see if it lives up to the hype, or if it’s no different than the other probiotics on the market today. I tested it to see what kind of results I’d get, but I also delved into the science behind it, took a closer look at the ingredients to learn about their safety, how convenient it is to include in your daily routine, and whether it’d be a smart buy for you. PrebioThrive smoothie blended with a scoop of peanut butter, banana, and a few chocolate shavings for extra flavor. It’s not a probiotic, but rather a prebiotic, which sets the stage for prebiotics in the body. Prebiotics contain no bacteria at all. The official website goes on to provide details about Dr. Gundry’s medical background and says he founded his own practice in 2004, The Center for Restorative Medicine. There are also a number of skincare products, food, and books available on the official website. PrebioThrive uses five of the most potent and effective prebiotic ingredients available: acacia gum, agave inulin, flaxseed, galacto-oligosaccharides, and guar gum. PrebioThrive is manufactured by Gundry MD, who produces a number of other health supplements. PrebioThrive works by helping your body to better balance the bacteria in your gut naturally. By providing more of what your body needs to support the growth of the good bacteria, it can work more efficiently. 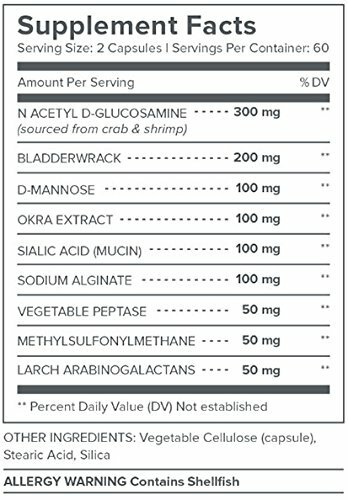 Remember, despite what the name would lead you to believe, there aren’t any actual probiotics in the supplement. According to the company, after the first couple weeks on the supplement, users will feel a boost of energy, and should also notice a decrease in bloating. 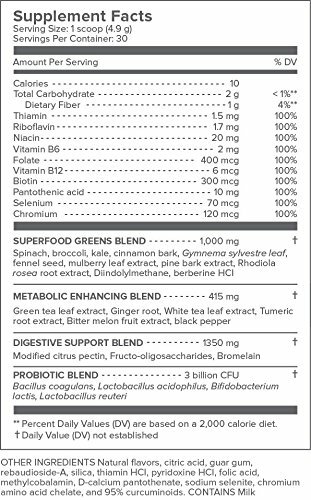 PrebioThrive, my prebiotic supplement, supports the balance of probiotic bacteria with a blend of dietary fiber to encourage digestive health and regularity. There’s plenty of science to show how omega-3 fatty acids and fiber are good for your overall health. Your body needs healthy fats to undergo many of the natural processes we need to function at our best. Your body also needs fiber to keep the digestive system regular. According to the Journal of Food Science and Technology, “Prebiotics like FOS, GOS, XOS, Inulin; fructans are the most commonly used fibers which when used together with probiotics are termed synbiotics and are able to improve the viability of the probiotics.” I see GOS and inulin here, which is nice because we know there are at least a couple of proven ingredients in the formula. You are supposed to mix a scoop of PrebioThrive into a glass of water, a smoothie, or another beverage, first thing in the morning. It is unflavored, so it won’t alter the taste of what you’re drinking. To get the full benefit of PrebioThrive, you should take a scoop every day alongside some probiotics to create a symbiotic effect. Use it consistently for the best results. Using this supplement is easy since all you have to do is mix it into your drink every morning. With over 630 positive reviews on their official website, and no shortage of people endorsing this product, they’ve got quite a bit of hype behind them. PrebioThrive contains prebiotics, or the nutrients that support the production of the healthy probiotic bacteria your digestive tract needs. I’ve got to point out, yes, they may be shown to help improve digestion, but of course, it’s still important to eat healthily, and exercise, in order to keep your body fat low. Prebiotics are necessary for the body to grow the probiotics it needs to balance the gut and promote healthy digestion and increased energy. That’s an important part of overall health, and if you have problems in that area, you’re definitely going to struggle with weight loss. It mixed into my drink really well, and I’m a little bit shocked to say that I actually enjoyed it! I’m not usually a fan of this sort of drink, but PrebioThrive surprised me. On their website, for the most part, there’s mainly positive customer feedback. I did spend more time in the bathroom, but I suppose that’s to be expected. I am on my second day, some pros: I have a lot more energy and was able to do a lot of walking, site-seeing yesterday than I haven’t done in a long time, I feel better, and my husband says that I have a better attitude! I wasn’t able to find any lawsuits, which is a great sign. Gundry MD has a B+ rating with the BBB, partially due to the fact that they’re relatively new as a product company. Since the supplements mainly contain natural ingredients, you aren’t too likely to experience many issues, as you might with using other synthetic products. You should expect to have some gastrointestinal discomfort when you first start using the product, as your body adjusts to the new bacterial balance. Most people say this goes away after using the product for a couple weeks. The general consensus seems to be the product is safe. But, if you’re a child under 18, or have any kind of medical condition, are pregnant, or nursing, you should still talk with your doctor before you start taking it. There is one allergy concern, as this product contains milk. Those who are allergic to milk or lactose intolerant should avoid this product. Flaxseeds are rich in the omega-3 fatty acid ALA, lignans and fiber, all of which have been shown to have many potential health benefits. Out of all of these products, PrebioThrive seems to have the most uniquely designed formula. PrebioThrive comes with a 90-day money back guarantee. All you have to do is call the company and request a refund. 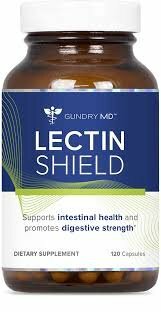 Based on the amount of clinical evidence for prebiotics boosting the good bacteria in your gut–not to mention, Dr. Gundry is a highly respected doctor himself–a supplement like this appears to be helpful for anyone hoping to balance their digestive system. Of course, as Dry. 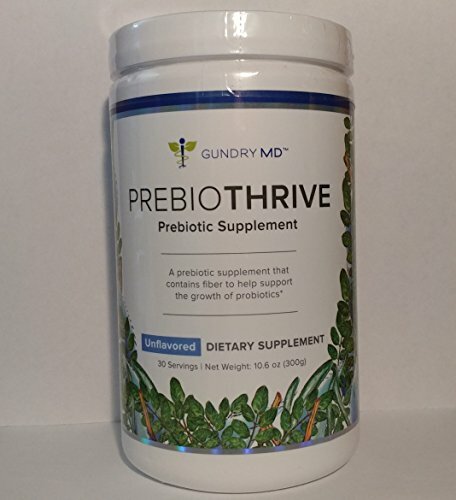 Gundry points out himself, in order to get the maximum results, you’ll want to take a probiotic along with PrebioThrive. 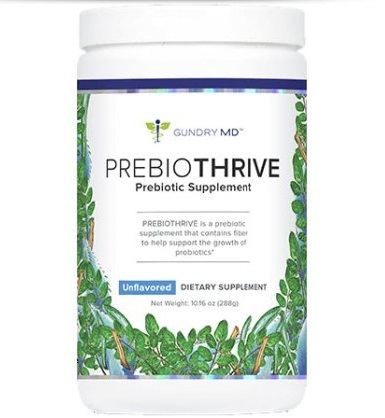 At the end of the day, if you’re skeptical about giving it a try, Gundry MD stands behind PrebioThrive by offering a 90-day refund, which is more than enough time to know if you’re benefiting from the product. So, what’s my final opinion? We don’t recommend a ton of products on this site, largely because there isn’t enough scientific testing to support them, but with PrebioThrive’s clinical evidence, and a 90-day window to get your money back if you’re not satisfied, you’ve got literally nothing to lose. And as always, be safe, be smart, and let me know what kind of results you get.